Because of an editing error, the phrasing in part of the April 4 article “MIT Settles Shin Case, Parents Agree Death Likely an Accident” could have been interpreted as saying that MIT and several of its employees sought damages of $27.65. 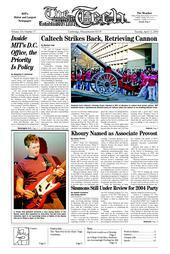 The $27.65 million lawsuit was filed against MIT and those employees. Because of an editing error, the April 7 article “Weese Elected GSC President” was inaccurate in reporting that no candidates were nominated to run for Secretary and Treasurer. Candidates were nominated, but they then declined, and therefore nobody was elected to those positions. The April 7 article “Hackers Have Blast With Caltech Cannon” reported that the Fleming House Cannon appeared on the MIT campus Wednesday morning when in fact it appeared on Thursday morning.